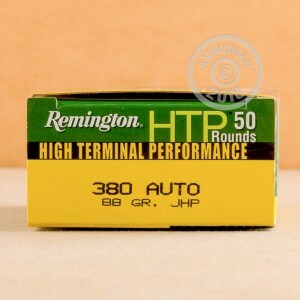 This .380 ACP load from Remington is part of the HTP ("High Terminal Performance") series of jacketed hollow point cartridges. It comes packaged in a case of 500 rounds at an economical price that allows you to test and train it in your pistol and still have plenty left over for self-defense carry. Ideal for the Colt Mustang, Sig P238, Glock 42, or Ruger LCP, these rounds use a light 88 grain JHP bullet, non-corrosive Boxer primers, and reloadable brass cases. Buy this case to benefit from AmmoMan.com's free shipping promotion. Our free shipping offer applies to all orders over $99 and helps bulk buyers enjoy the shooting sports and prepare for self-defense situations at a reasonable cost that doesn't starve their kids or annoy their spouses. 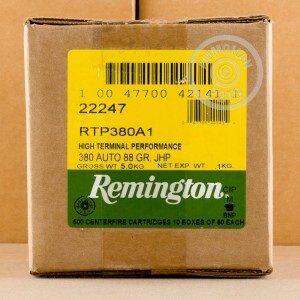 This is very good place for your ammo needs!!!! Great price for the going rate and fast delivery to my doorstep! Great price for the going rate and fast delivery to my doorstep! Couldn't ask for any better! I'll be back.... As the famous phrase states! 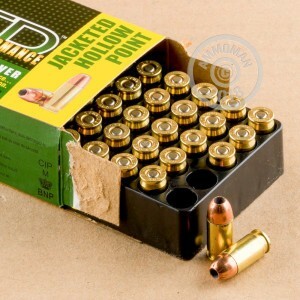 Runs out great, kills 1/2 inch plywood at 40 ft.. Just what I was looking for in 380 ammo.